By Azzief Khaliq in Internet. Updated on November 19, 2017 . Internet browsers have come a long way since the days of Netscape Navigator, but the way we browse and manage our bookmarks hasn’t really changed much over the years. There’s nothing really wrong with the classic folder view, but what if there were a better-looking way to manage bookmarks, complete with smarter search features and support for tagging? Well, there is, and it is called Dewey. Dewey is a Chrome application that provides a better way to manage your Chrome bookmarks. Not only does it have a great-looking minimal interface with website thumbnails, it also offers some extra features such as more robust searching, tagging and a few sorting options. If you’ve been yearning for a new take on bookmark management, Dewey might just be it. First, of course, install Dewey from the Chrome Web Store. Since Dewey is a Chrome App you’ll have to launch it from either the Chrome App Launcher or the Apps view accessible from the New Tab page. When you launch Dewey, it’ll open as a new tab in your Chrome window. There’s no registration or extra setup required with Dewey, since all it does is access your bookmarks and present them in a different way. So, once you have Dewey installed, you’re good to go. Dewey takes the grid layout you’re probably familiar with from Chrome’s New Tab page and applies it to your bookmarks. Dewey doesn’t show thumbnails by default, though; to turn them on, you need to go into the Settings menu ( gear icon in the top right). Here, you can enable or disable thumbnails (Show thumbnails) and determine whether Dewey ‘sees’ Chrome’s top-level bookmarks folders Bookmarks Bar, Other Bookmarks and Mobile Bookmarks (Hide top-level folders). That second option is particularly handy because tag support. To be more specific, Dewey automatically tags your bookmarks according to your bookmark folders. So, if you don’t want your bookmarks to be taggged with Bookmarks Bar or Mobile Bookmarks, then you’ll want to enable Hide top-level folders. Of course, you can also add your own tags to bookmarks. 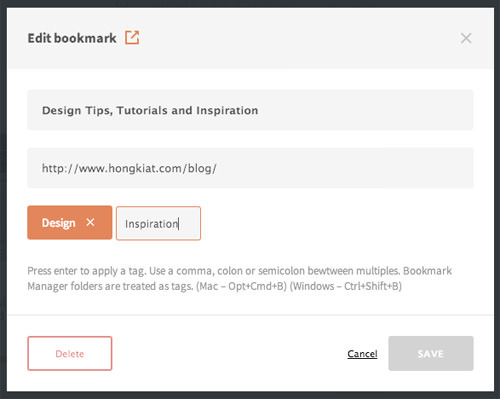 Just click on the Edit button and a window will pop up allowing you to edit the bookmark’s title, URL and tags. This pop up window is also where you delete bookmarks from within Dewey. Dewey also includes comprehensive search capabilities accessible from the search bar at the top of the Dewey bookmark view. By default, Dewey searches for your selected keyword in your bookmarks’ tags, titles and URLs. However, you can also limit your search to tags, titles or URLs. Adding tag: before a keyword will limit the search to tags. Adding title: before a keyword will limit the search to titles. Adding url: before a keyword will limit the search to URLs. Clicking on any particular tag will also filter your bookmarks to only show bookmarks with that particular tag. 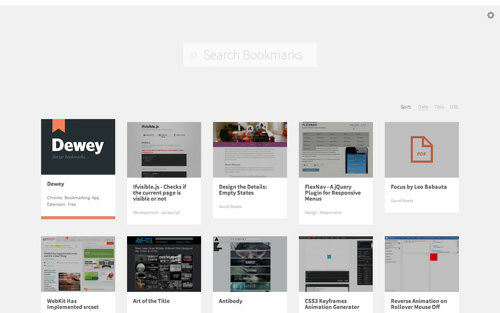 Dewey lets you navigate through your bookmarks with your keyboard. Use the Tab and arrow keys to navigate the bookmarks grid, and press Enter to open the selected bookmark. In addition, you can sort your bookmarks according to date added, title and URL. Dewey is definitely an interesting new take on the tired old bookmarks display. 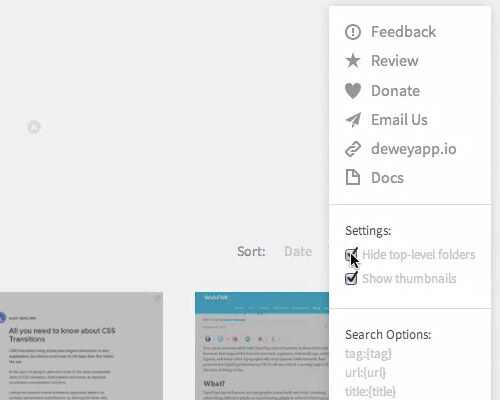 If you have a lot of bookmarks and wish there was an easier way to search through them, or you’re just looking for a prettier way to manage your bookmarks, Dewey is definitely something you should try out.